Jayprakash Bezbaruah, 50, was mauled to death on wednesday afternoon by two tigers who also ripped off his left arm as his wife and sons watched in horror. The family had arrived in Guwahati today from Sivasagar, 355-360km away, for a holiday. Digital camera in hand, Bezbaruah sneaked past the first barrier where wife Rita and their two school-going sons stood with a relative and other visitors crowding Assam State Zoo at 2.10pm. He wanted a close shot of the tigress Divya sunning herself. The junior technical instructor reached the tigers’ enclosure a metre away and then made the second, fatal, mistake: of stretching his hands holding the camera through the iron railings. Govardana, a second tiger that he hadn’t seen lurking near the enclosure wall directly below him, grabbed Bezbaruah’s left arm. In no time, Divya joined the attack, sinking its teeth into his arm and clawing his face. 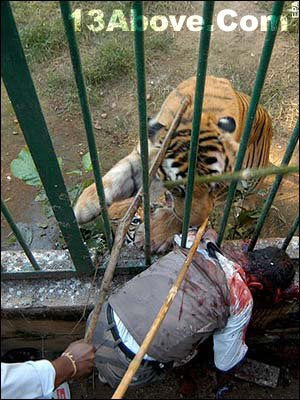 Visitors raised an alarm and zoo-keeper Bapukon Baishya rushed to try and beat back the tigers with a stick. But they let go only when Bezbaruah’s arm was ripped off from the shoulder. “Although Divya slackened the grip when I intervened, Govardana did not budge and got away with the hand,” Baishya later said. Bezbaruah was rushed to Gauhati Medical College Hospital where he was declared dead on arrival. Rita was hysterical. “Oh, God… this is unbelievable,” she screamed as the doctors said her husband had died of excessive bleeding and shock. Back at the zoo, visitors were witness to the macabre sight of Govardana pacing around the enclosure with the severed arm in its mouth. The tiger later ate it up, zoo sources said. Zoo veterinarian M.L. Smith said seven-year-old Govardana, like other male tigers, was “very aggressive” and had even killed and eaten its own cub a few months ago. Another visitor, Prashanta Gogoi, claimed the zoo staff had told Bezbaruah not to cross the first barricade, which is where visitors are expected to stop. 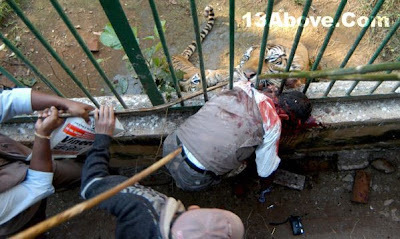 A boy who was witness to the attack, Lalit Lahkar, said the victim “probably did not notice the other tiger, which was near the wall inside the enclosure”. As soon as the tiger caught hold of Bezbaruah’s arm, Lalit said, he raised an alarm. “I shouted ‘tiger, tiger’ and a zoo-keeper who was nearby rushed in and tried to chase away the animals with his stick,” the boy said. The zoo has nine Royal Bengal Tigers. Five of a family are kept in one enclosure, Govardana and Divya are in an adjacent enclosure and the two remaining tigers in a third enclosure. Govardana and Divya were brought to the state zoo in 2005 from Karnataka, Smith said. Divya turned five today. The Bezbaruahs belong to Jorhat, about 300km from Guwahati, and Jayprakash worked at a technical institute in Sivasagar which is about 55km from their hometown.